Jason Day celebrates on the 18th green after winning the 2015 PGA Championship on Sunday in Sheboygan, Wisconsin. Heading into last weekend’s PGA Championship, Australia’s Jason Day had cracked the top five in nearly a third of the major championships he’d entered. He finished in the top 10 nearly half of the time. But he’d never hoisted one of those shiny trophies they give the tournament winner. That changed Sunday, when Day won the PGA Championship, breaking the record for lowest to-par score (-20) in a major. Yet Day’s record-shattering performance also highlights just how easy it was to go under par at the majors this season. While Day’s week at the PGA ranks No. 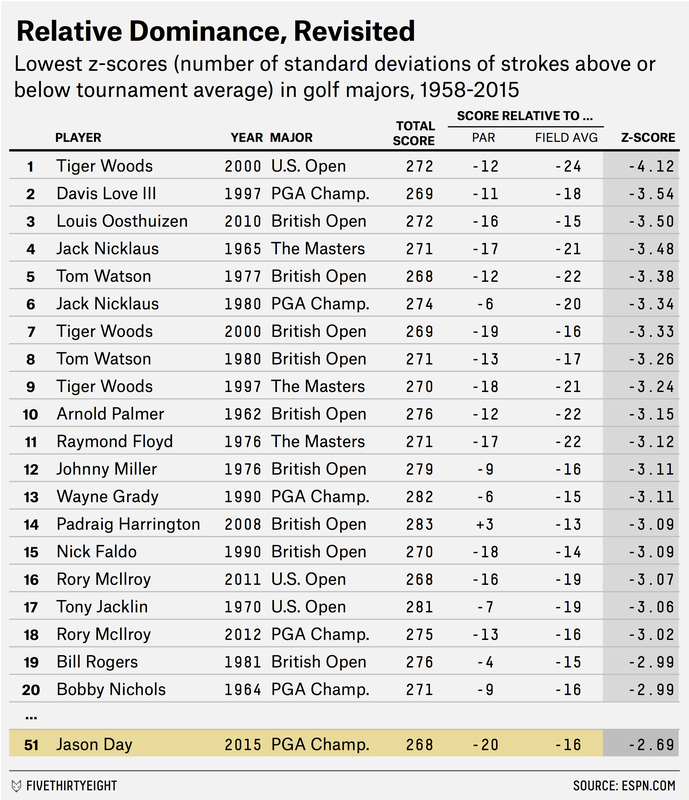 1 according to cumulative strokes below par, it’s nowhere near the best in modern history1 if we examine it using our familiar z-score system, which measures each performance relative to the field (by how many standard deviations a player’s score was below the field average, for players who made the cut). Last weekend’s low-scoring PGA Championship also capped off a season of great performances by the field in majors. July’s British Open featured the lowest to-par scoring average (-5.6) of any major since 1958, and April’s Masters Tournament (-2.4) ranked 11th-lowest. Combined, this year’s quartet of majors saw the lowest scoring average (relative to par) of any season since 1958, and the only time in that span that the average cut-maker across all majors in a season was under par. The majors in 2014 ranked second-lowest, so we’re seeing an unprecedented spate of low-scoring performances in recent seasons, though it’s not clear what’s driving the trend. We can turn to the usual sources of speculation: technological improvements outstripping course designs, a (subconscious?) movement toward friendlier scoring conditions to improve golf as a television product, an incredible font of young talent emerging in the wake of Tiger Woods’s heyday, etc. Whatever the cause, it’s leading to players like Day going low on the game’s biggest stage, even if their performances aren’t historically great relative to their peers. He didn’t win the PGA Championship, but Jordan Spieth is still having one of golf’s greatest seasons. 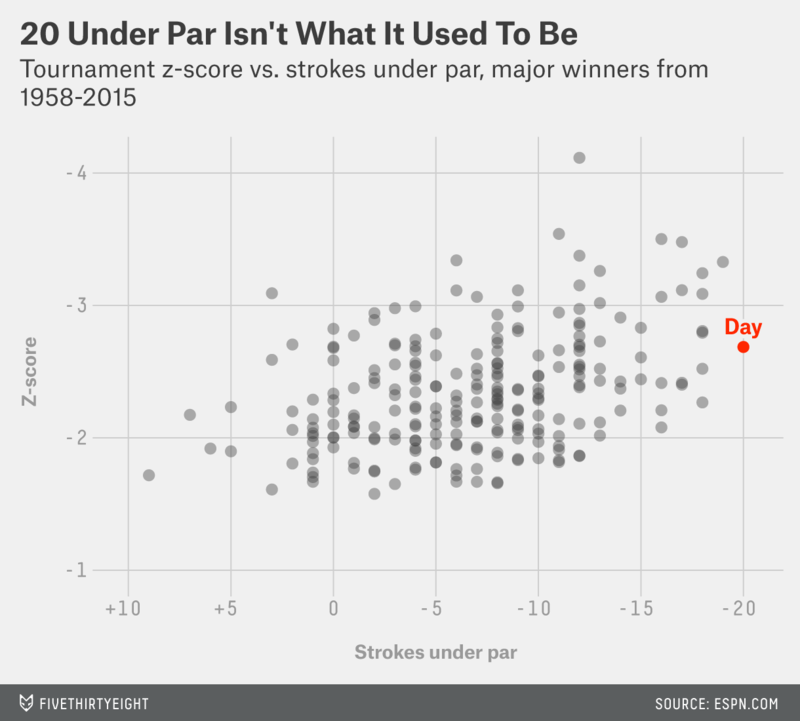 Which, for the purposes of this article, began in 1958 — the first year the PGA Championship adopted a stroke-play format.